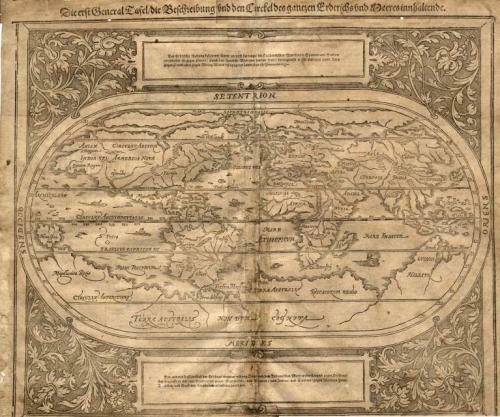 A famous German map which was the standard world map until the Abraham Ortelius atlas of 1570 was published. Interesting features include the southern continent and a large North West passage. The central fold has seen some flaking and browning and a tissue repair has been made to the verso. The map is close trimmed to the lower margin with a 3mm loss to printed border. There are a few small wormholes but generally the map is in good shape for it's approximately 420 years of age.